Taking care of a body can be really confusing. 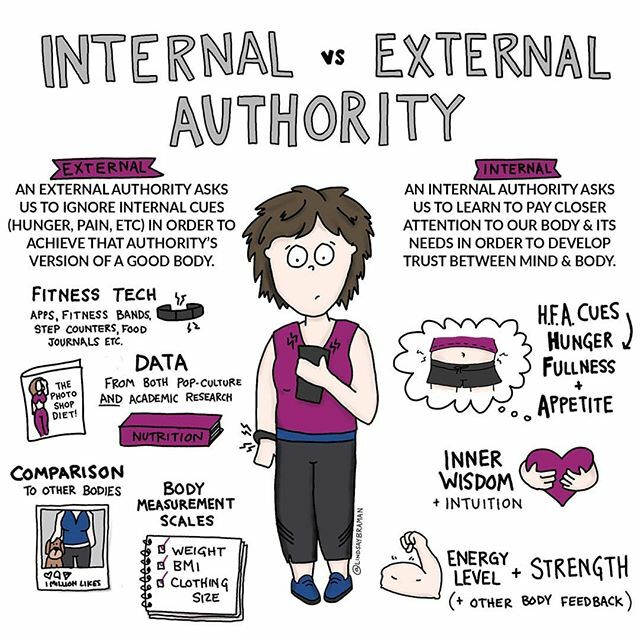 As more and more data and tech are available to us, it’s so tempting to consume and compare- but trusting trackers, food logs, and external body ideals can actually erode trust in our own body and in the signals it gives us. When we wait to eat until a food journal gives us permission to eat, or exercise until a tech device tells us we can stop, we ignore the voice of our own body’s wisdom signaling hunger or tiredness. Our body’s voice, like all voices, responds to being ignored in only two ways: by growing silent or by growing very, very loud. Our body’s voice, like all voices, responds to being ignored in only two ways: by growing silent or by growing very, very loud. If ignored long enough, our internal cues of hunger, fullness, pain, tiredness, etc can fade to indiscernible cues. When we ignore this inner voice long enough, the voice may burst through: hunger turns to an uncontrollable urge to binge, pain ignored turns to major injury, our unnoticed fatigue delivers us to the doorstep of burnout or breakdown. Ignoring our internal cues when it comes to food and movement can make it much harder to tune into that system of inner knowing when we really need it (like in relationships, in getting medical care, or in situations where we need to assess our personal safety). In case no one has told you lately: YOUR BODY IS WISE. Your body is not the enemy. It does not require being caged, restricted, or controlled. It deserves to be treated with the care you’d give to someone you love: Let it take up space. Don’t ignore it when it’s talking, and if it’s just whispering, pause to listen- because its voice matters. One commenter on Instagram brought up the counterpoint that sometimes bodies have “cravings due to habits and addictions, not out of actual need.” This is a point worth addressing- as I think it’s important we tease apart how “noticing” body sensations does not mean automatically reacting. Like any language, it takes learning how your body speaks, and the ways in which it might be confused. Let your wise mind engage with the wisdom of your body (and, as appropriate, the wisdom of professionals) to respond with care. Let your wise mind engage with the wisdom of your body (and, as appropriate, the wisdom of professionals) to respond with care. I actually do believe all bodies have wisdom- even when the wires are crossed or the body seems to be asking for unhealthy things. All bodies speak wisdom, but the vast majority of us have had it almost completely rewired through how our culture (and often our families, and sometimes traumatic experiences in our body) taught us to relate to our bodies and our food intake. Cultivating trust in an inner authority doesn’t automatically mean denying external authorities, or that suddenly we react to every sensation we feel, but actually means the start of a long process (for many of us, with the help of a therapist or dietician) to learn to listen well and unjumble those signals, with the goal of being able to mindfully feel, acknowledge, and choose how to respond to our body.